Free Shipping Included! Brawny Tear-A-Square Paper Towels, 12 Rolls, 12 = 24 Regular Rolls, 3 Sheet Size Options, Quarter Size Sheets by Brawny at Hosted Payload. MPN: 41705. Hurry! Limited time offer. Offer valid only while supplies last. New Brawny Tear-A-Square paper towels with quarter (1/4) sheets offers three sheet size options so you can use just what you need without the waste. 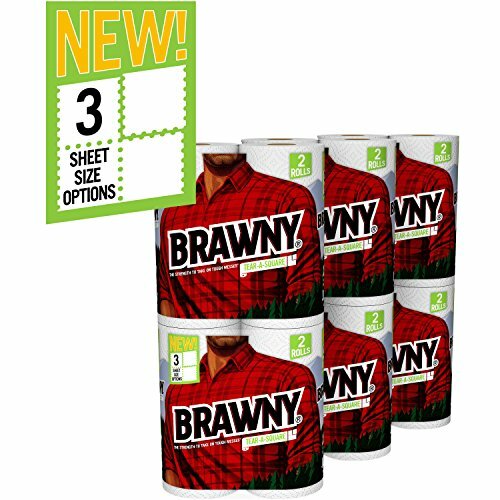 New Brawny Tear-A-Square paper towels with quarter (1/4) sheets offers three sheet size options so you can use just what you need without the waste. With the option of a quarter sheet, half sheet or full sheet on each Brawny Tear-A-Square paper towel roll you can choose the right paper towel sheet size to suit your needs. Gone is the guilt of using a full sheet or a half sheet paper towel when only a quarter sheet is needed for your smaller tasks. Like all other Brawny paper towel products, Brawny Tear-A-Square 2-ply premium white paper towels are strong, absorbent and durable. They are perfect for both tough messes and small everyday clean-ups. Use Brawny Tear-A-Square quarter sheet size paper towels for small spills and quick clean-ups, to place snacks, as a napkin or a coaster. Brawny Tear-A-Square paper towels – the strength of Brawny for messes big, small and anywhere in between. New innovation. Same Brawny. If you have any questions about this product by Brawny, contact us by completing and submitting the form below. If you are looking for a specif part number, please include it with your message. Majestic Pure Fractionated Coconut Oil, For Aromatherapy Relaxing Massage, Carrier Oil for Diluting Essential Oils, Hair & Skin Care Benefits, Moisturizer & Softener - 16 fl Oz.